Wool carpets are known for their quality because wool is naturally tough, giving you luxury that lasts for longer. 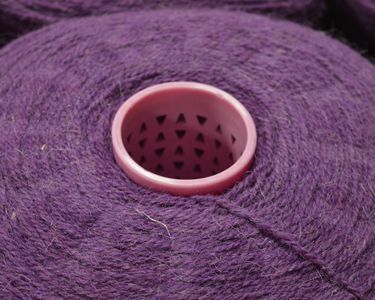 British Wool tells us the science behind this amazing fibre. 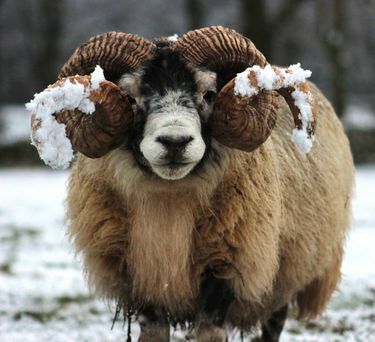 It might be pouring with rain, snowing, windy or beautifully sunny – whatever the weather, you’ll always see sheep grazing happily in the British countryside. And that’s thanks to their clever wool coats, which protect them in all weathers! Wool is an amazing natural fibre. Composed of proteins, its complexity provides many features and benefits that man-made fibres could never replicate, offering complete flexibility and superior performance characteristics. It’s fire retardant. Wool is difficult to ignite due to high water and nitrogen content. If you hold a match to wool, it will smoulder and then go out. It doesn’t melt, drip or give out poisonous fumes. And this means it’s considered one of the safest fibres for flooring and fabrics – the perfect choice for the family home. 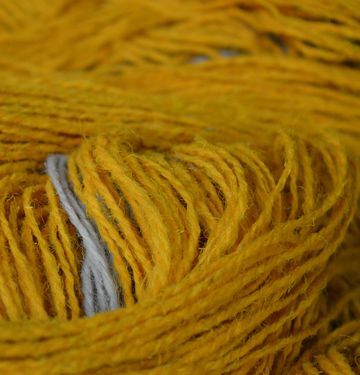 Wool is an incredibly complex natural fibre, which means natural attributes that plastic fibres just can’t match. Wool has a left and right handed helix at its core, which works likes a spring, meaning it can continuously resist pressure and flattening. It can be bent many thousands of times and still spring back! And this is why British wool is such a great fibre in carpets. Wool’s natural oils and scaled structure trap dust and dirt at the top layers of the fibre, so it couldn’t be easier to keep clean with a quick vacuum around! The scales on wool are another amazing feature - they cause liquids to bead up and stay on the surface, helping to keep wool stain free. So if you’re quick, that red wine won’t leave a single mark! Wool is grown naturally on sheep. They live on and from the land, roaming freely in the countryside, and re-grow their fleece every year. This is in direct contrast to synthetic fibres, which need oil and refineries to be produced. Sheep grow wool continuously, and can be shorn every 9-12 months, meaning wool is rapidly and readily available. As long as there is grass for sheep to eat, wool can be produced. Wool contributes to healthier air indoors by helping to absorb pollutants, like VOC’s, from the air. Allergens, such as dust, are also trapped in the outer scales at the top layer of the fibre, so instead of floating around and aggravating allergies, they can simply be vacuumed away. Follow @BritishWool on Twitter, Facebook and Instagram. What was the inspiration for this room? Have you had to adapt your personal style and design choices to be sympathetic to the period of property you are in? Well, it’s still very much a blank canvas really – the carpet does all the talking and so I’m working out what will showcase it and not fight for attention. I love that the room has so many gorgeous architectural features so it really doesn’t need a lot else – I want it to feel smart but cosy, elegant but lived-in. The piano will stay here and the books are all moving in, so it’s a matter of finding the right seating. My husband has to constantly remind me that it’s a family home and not a magazine spread so we have little to-dos about my furniture choices and I like to do the same about his choices, so I imagine we’ll still be deciding next year! At least the carpet is incredible – we like to come in and sit on the floor!! 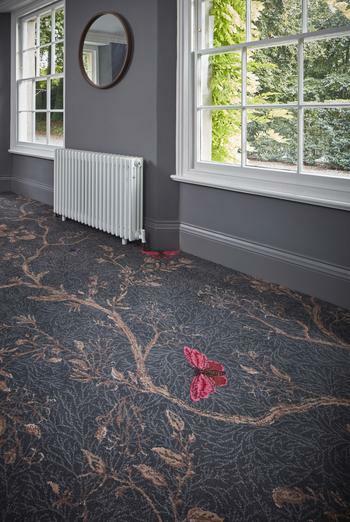 What appealed about the Noir Ruskin Butterfly design? It’s just magical. Like an illustration from a story book. But a dark one. There’s something very enticing and provocative about the colours and the design and although it’s a massive statement, it makes the room feel very comfortable and less formal and straight than it did before. 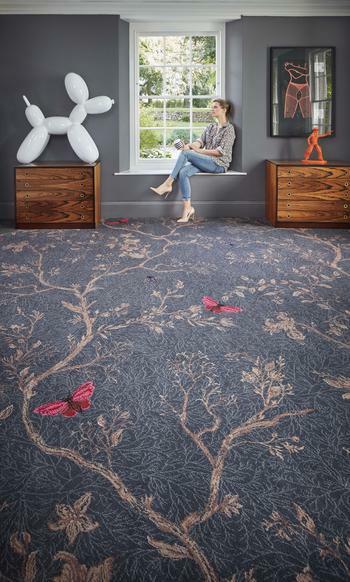 How have you found decorating the rest of the room given the carpet makes such a strong statement. Still working on that one – I think that with a pattern as strong as this, you start with the carpet and put in your furniture and then decorate last. 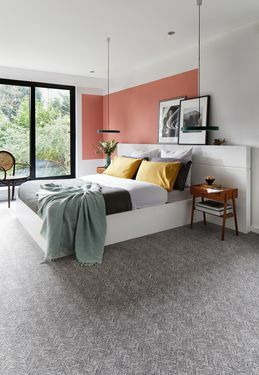 If you’ve got a neutral carpet then it’s not so much of a consideration but with a strong pattern I think that you need to keep everything else quite subdued. In a way it’s far less work! Though I’d like the walls to be a warmer tone, now, so I can see that they’ll get a repaint at some point. I’ll keep you updated! What home accessory could you not live without? Is there a restaurant or hotel whose design you particularly like/admire? Yes, there's a hotel in Surrey called The Aviator and it’s next to a private airfield so you watch the planes taking off and landing through the triple-glazed, sound-proofed windows. It’s very modern, very smart and has some incredible design features, like the main staircase. I think that hotel greatly influenced our last renovation, actually. I suppose I should think of hotels that I’ve drawn inspiration from for our Georgian house; I like the comfortable style at Babington, I love the pictures that people take of the Artist Residence hotels, the Endsleigh in Devon is beautiful… I have to say though that my friend Miles has the most incredible house in Cheltenham and his taste is impeccable, so every time he posts an Instagram photo I zoom in to see how he’s decorated!